ATOPHK is committed to provide quality home and life style products with its mission to pursue 100% customer satisfaction by providing best products and services Apple iWatch & AirPods Stand The ATOPHK iwatch stand is compatible with Apple watch series 2 / series 1 both the 38mm and 42mm Apple watch sizes, it supports Nightstand Mode. The AirPods charging dock is beautifully shaped, and it charges your AirPods Case efficiently. Specification Material: Solid GB Aluminum Colour: Silvery / Gray / Black Detailed Size: 13.8 *8.7 *8.9 cm (L * H * W) Net Weight: 190 g Total Weight: 238 g Package Includes 1 * 2 in 1 Charging Stand 1 * Instruction Contact us Any quality problem with product or unhappy shopping experiences, please do not hesitate to contact us, we will try our best to satisfy you. Your great support and interest are Our biggest motivation for innovating & improving our services. 【Elegant and Practical】: The graceful shape of circular cutout is designed in the manner of mysterious eyes, it looks like Duo Evil Eye. The best designed angle steadily holds your Apple iWatch, it also supports Nightstand Mode, which will display the time as long as it's charging. And AirPods charging dock charges your AirPods Case efficiently and avoids your AirPods missing. 【Solid Construction】: This stand is made of highest quality solid GB aluminum, which has gone through 9 specialized processes. It is constructed with refined polishing and anodizing, there are no sharp edges, perfectly finished for a solid build. Smooth surface and highlights edge, full of texture and three-dimensional sense. The non-slip pad on the bottom enhances the stability of the whole unit. 【Smart Cable Management】: The stand has built-in cable path for each cable which makes everything organized. The bottom is provided with anti-skid silicone pad which provides you durable and sturdy stand. 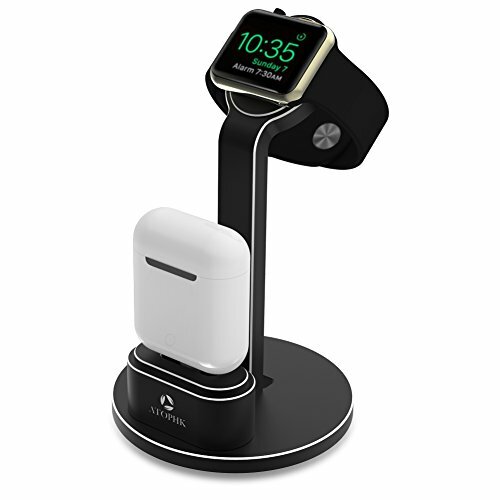 【Compatibility】:This multifunctional stand is perfectly compatible with First and Second Generation Apple iWatch (38mm 42mm) and Apple Airpods. If you have any questions about this product by ATOPHK, contact us by completing and submitting the form below. If you are looking for a specif part number, please include it with your message.